Welding wire plays an important role in the strength of MIG welding and, in particular, the strength of the welded joints. While it’s possible to combine any number of different metals or metal alloys with MIG welding, the strength and durability of those welded joints depends on the wire. While the best wire for the job will vary depending on the metals used, there are a few tips to keep in mind when selecting welding wire. Identify your metals. Even though various metals can be used in MIG welding, the three most common are: carbon steel, stainless steel, and aluminum. These base metals, as they are called, influence the composition and thickness required of the welding wire. Match your wire. Ideally, the welding wire will be the same type of metal as the metal that is going to be welded. Stainless steel metals should be used with stainless steel wires, carbon steel with carbon steel wires, etc. Keep this in mind and refer to the wire’s primary metal when choosing welding wire. There’s no need to avoid mixed metals in favour of pure metals. It’s not unusual for MIG wires to include additional elements along with the metal. Elements like manganese, silicon, and titanium are often added to wires to make the welds stronger, more stable, and less porous or prone to oxidation. It’s perfectly ok, and sometimes preferable, to choose a wire that has these additional elements in it. Pay attention to thickness. The thickness of the base metals determine the thickness of the wire you’ll use. Check the wire thickness charts on wire product packaging to help guide your decision. Keep in mind that there’s a range of thicknesses that will work for standard wire diameters, so you don’t need to know the exact gauge of the plates being welded. Josef Gas is the only source you need for welding. We carry welding equipment, welding gas, and filler materials like welding wire to complete any project. You’ll find all the top brands like Lincoln, ESAB, Avesta, and Harris in one spot! 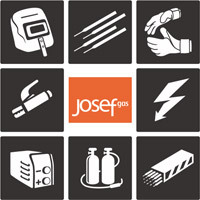 Visit our Welding Equipment page to see what we have in stock or contact us at 416.658.1212 or info@josefgases.com to discuss your project needs today!